With traffic cameras, paid parking, smoking and alcohol restrictions, post-Soviet Moscow has turned 21, and is settling down. Last week, an American friend of mine received two mysterious white envelopes in the mail. On opening them, he found that each contained a black-and-white photo of his car, each taken secretly, in the middle of the night. Below each photo was printed: his name, his employer and his home address. No, this was not the U.S. National Security Agency tracking down a runaway American who owes money on his student loans. 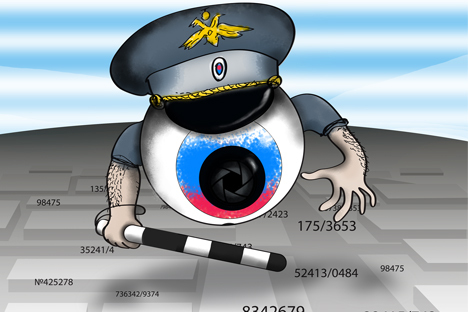 Moscow now has secret traffic cameras. The cameras caught my friend, speeding home from his girlfriend’s apartment at 1 a.m. In two 80 kilometer-an-hour zones, he was clocked at 100 kilometers an hour. The fine: 300 rubles – about $10 – if paid promptly. Long gone are the days, when my son James watched bug-eyed as a Moscow taxi driver hit 200 kilometers an hour gunning his cab down the final highway stretch to Sheremetyevo Airport. Just as James has grown up and now has a job in New York, post-Soviet Moscow has turned 21, and is settling down. Nowadays, Moscow’s wild days increasingly are seen only in the rear view mirror. As of last week, there is new street furniture on streets of Moscow’s innermost core: parking machines. Street parking is 50 rubles an hour – about $1.50. To cut corruption that comes with the human element, the parking spaces are digitally monitored. To cut cruising for spaces, a mobile app tells drivers where there are open spaces. Owners of $50,000 SUVs are proving amazingly stingy. All of a sudden city parking spaces are free of cars. Tverskaya, the Fifth Avenue of Moscow, is now a civilized European avenue, free of cars parked on the sidewalk. In another attack on Moscow’s car culture, 130 bicycle rental stands are opening this month across the city. Following such cities as Berlin and New York, bicycle rentals are accessible through a mobile phone app. Monumental traffic jams still define Moscow life. But two sources are being phased out. Helipads have been installed at the Kremlin and at Russia’s White House. Now, President Vladimir Putin and Prime Minister Dmitry Medvedev can commute by air from their estates in the western suburbs. Previously, official motorcades provoked such horn-blowing dins from angry drivers that I would capture “natural sound” for radio reports by sticking my microphone outside the window of the VOA office on Kutuzovsky Propect. On Sunday afternoon, while inspecting a new bicycle stand next to the Arbatskaya metro station, I spotted another novelty: pay toilets. Located between the station and Russia’s Defense Ministry, these cabins are designed to break the habit of some Moscow men who seem to enjoy urinating in full view of Russia’s military high command. But judging by the familiar acrid, odor of the spot, some men are too cheap to pay. The Kremlin’s reformist zeal does not stop with pay toilets. As of June 1, smoking is banned outside metro stations, building entryways, schools and hospitals. So far, police are limiting themselves to verbal warnings. But the big test comes one year from now. On June 1, 2014, smoking is banned from all of Russia’s bars and restaurants. In Russia, where 60 percent of adult men smoke, the current attitude is denial. kuryiashi sektor?” the hostess gave me a condescending look as if I asked for a glass of warm milk and a bowl of porridge. Let’s see who is laughing this time next year. Denial was the reaction when President Vladimir Putin promised to close all of Russia’s casinos on July 1, 2009. Smart people said it would not happen. The deadline came. The casinos were closed. Since then, with less fanfare, all cigarette and alcohol ads have disappeared from billboards, televisions, newspapers and magazines. The anti-tobacco campaign is being matched by an anti-alcohol campaign. Sunday night, around 11:30, after dinner at a friend’s apartment, I stopped by a local supermarket to pick up groceries for this week. On filling my cart, my eye was caught by a special sale display of California Zinfandel. As I was holding a bottle of red wine to the light, a blue-uniformed supermarket guard appeared out of nowhere. He politely, but firmly, reminded me that all store sales of alcohol now stop in Russia at 11 p.m.
Small stores have lost the right to sell alcohol and cigarettes. In recent months, this law change had prompted the closure of thousands of small, freestanding kiosks across Russia. As it is, supermarkets routinely place their liquor stocks deep inside the stores, knowing that liquor pull huge amounts of foot traffic through stores. At the same time, police are enforcing a radical crackdown on drunken driving. In most of the United States, a man my size – 1m 94 and 88 kilos — can have two glasses of wine with dinner, and then get behind the wheel. In Russia, zero tolerance means zero alcohol consumption. One glass of wine means you are over the limit. This zero consumption approach comes from the belief that once Russians start drinking, they do not stop at two glasses. Indeed this is a nation where vodka is often sold in bottles with tops designed to prevent re-corking. It used to be said that Sunday morning was the most dangerous time to drive in Moscow: All the drunks were tumbling out of the nightclubs. Now Moscow’s night scene has a new figure – the designated driver. And on Saturday nights, half the wheels on city streets belong to taxis. During the Gorbachev era, radical measures for social improvement led to tobacco and vodka riots. Putin’s sneak attack on Russians’ self-destructive habits has the same goal as Gorbachev’s blunt approach: to raise birth rates and life expectancies for Russians. Currently, life expectancy for Russian males is about 60 years. Last week, Moscow Mayor Sergei Sobyanin announced that the combined life expectancy of Moscow men and women – about 10 percent of Russia’s population – has reached 75 years, near the levels of Western Europe. He may have declared premature victory. But then again, he just announced that he is running in a snap mayoral election, to be held Sept. 8. Sobyanin is leading in polls, with voter approval rating of about 50 percent. Polls indicate that voters like his campaign against cars, cigarettes and alcohol. In the first quarter of this year, about 9.5 million Russians vacationed outside of the former Soviet Union. On returning home, this growing and influential segment of the population is demanding the same levels of urban amenities that they see in Western Europe. Moscow’s wild days may be receding into the history books and Hollywood stereotypes.